With its best-in-class combination of features, versatility and performance, the OHAUS Navigator® Series offers a wide range of use in industrial, food and laboratory weighing applications. Capitalizing on touchless operations we have become accustomed to in our daily lives, such a those in automatic door openers, dispensers and bath and kitchen equipment, the Navigator XL applies the same primary benefits this technology has to offer: Cleanliness and Convenience. 194 x 203 mm 9 in. x 6.9 in. OHAUS raises the bar in value-oriented scales…again! The Navigator® series offers a unique combination of features, including touchless sensors, ultra-fast response time and superior overload protection for use in a wide variety of weighing applications. Touchless Sensors – The Navigator Series is designed with two touchless sensors that will free up your hands so you can focus on handling samples. The touch-free control of the zero, print, function or tare operations helps to avoid transferring sample residue to the keypad. In addition, the two sensors can be set up independently to control up to 36 combinations of operations. >One Second Stabilization Time – The Navigator Series is designed to accurately stabilize in less than one second to provide fast and accurate weighing results, improving operator efficiency, productivity and throughput. Superior Overload Protection – The Navigator Series is designed with a superior mechanical overload protection system that allows the scale to withstand loads up to 400% of its rated capacity. This prevents damage to the scale and helps it withstand undue shock or overloading. In addition, an integrated shipping lock further protects the weighing cell from damage during transportation or storage. Multiple Application Modes – The Navigator Series is designed for versatility. Multiple application modes such as counting, percent weighing, checkweighing, display hold and accumulation/ totalization address a wide range of use in quality control, inventory management, shipping and receiving, recipes and formulation, portioning and other popular applications. With its best-in-class combination of features, versatility and performance, the OHAUS Navigator® offers a wide range of use in industrial, food and laboratory weighing applications. Designed with two touchless sensors that free up your hands, allowing you to focus on handling samples and keeping the scale free from contaminants. The touch-free control of tare, zero, print, function and display backlight helps to minimize touching the keypad, thereby avoiding cross-contamination or unwanted residue on or from the scale. A polished stainless steel pan, corrosion-free plastic housing and spill-resistant pan sub-assembly embodies a hygienic design that is easy to clean. The optional full-body in-use cover wraps over and around the housing and keypad to guard against spills, dust and contamination. Amazing stabilization in less than one second to provide fast, accurate and repeatable weighing results; improving operator efficiency and increasing productivity. Includes an internal rechargeable lead acid battery that operates up to 100 hours (or over twelve 8-hour days) of normal use on a full charge. With maximized portability, the scale can be transported and used where power outlets are not readily available. A wave of the hand over the touchless sensors eliminates the extra effort or time to press the keys. A bright backlit LCD display provides optimum visibility in any lighting condition – indoors or out – with large digits and indicators that make it fast and easy to read the weighing results. Built to handle serious loads, the superior mechanical overload protection system enables the scale to safely bear loads up to 4 times its rated capacity. 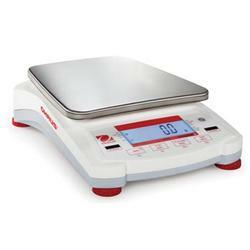 Constructed of a high-strength 304 type stainless steel pan and impact-resistant ABS plastic housing that helps the scale stand up to years of use. The touchless sensors minimize keypad use, reducing operational wear and tear. Designed to be easy to clean, precise and simple to use in laboratory environments. Simple set up, a spill-resistant housing, percent weighing mode and security features make this the ideal solution for laboratory applications such as formulation, quality inspections, testing and experimentation. Designed to be robust, fast and accurate for ideal use in light-medium duty industrial applications, including paint and ink mixing, packaging, sampling and parts counting. Up to 400% safe overload enhances protection of internal components, with an ultra-fast, one-second stabilization time to improve operator efficiency and productivity. Designed to be tough, portable and reliable for ideal use in shipping and receiving, home office and warehouse environments. A display hold mode holds the weight for viewing that would otherwise be blocked by oversized packages. Battery operation, counting and checkweighing modes also expand range of use for hobbies, inventory management, inspection and quality control. A top-quality polished 304 stainless steel pan is highly durable, easy to wipe clean and keep sanitary. Independently adjustable to properly level the scale. With skid-resistant rubber pads that provide superior stability on most surfaces, and help prevent the scale from slipping or falling over a counter. Set up the two sensors independently to operate up to 36 combinations of functions without touching keys. Touch-free operations prolongs the life of the keypad and keeps the scale clean from contamination. Control: tare, zero, print, function and backlight. The Bright white backlight provides optimal visibility in any lighting condition-indoors or out. The large digits and indicators also make it fast and easy to read the weighing result. Tactile keys, menu callouts and straightforward setup menus take the guesswork out of setting up the scale. Forget about complicated training-operate the scale most right out of the box. Accurately stabilizes in less than one second. Fast and repeatable weighing results maximize operator efficiency, productivity and throughput. Safely bear loads up to 400% of capacity. The Mechanical Overload protection system prevents damage to the scale from undue shock for overloading. Counting, percentage weighing, checkweighing, display hold, accumulation/totalization. Versatility for a wide range of applications including quality control, inventory management, shipping and receiving, recipes and formulation, portioning…and more. The integral level bubble is illuminated on power-up to aid in visibility and serve as a reminder to level the scale prior to use. The top housing assembly features spill-resistant gutter around the pan sub-assembly that direct liquids away from sensitive components. Low-maintenance and corrosion-free, the impact-resistant ABS plastic housing is easy to clean and lightweight to enhance mobility. Easily installed RS232, USB or Ethernet user option allow the scale to be connected to a printer, computer or other peripheral devices to print and/or collect weighing data. Connecting cables are integrated in each kit, eliminating the need for additional cables. 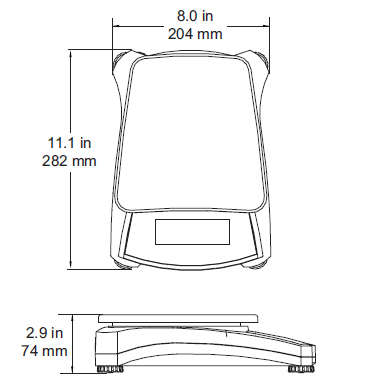 Available with an optional locking cable to secure the scale to a workstation. Prevent unwanted movement or possible theft to safeguard your investment. Operates up to 100 hours on a full charge. This minimizes battery replacement cost and maximizes portability. The lightweight scale can be easily transported and used in areas where power outlets are not readily available. Prevent unwanted changes to protected scale settings. Simply set up the scale to meet your specific needs, then slide the lock switch to avoid changes and calibration. Prevents undue pressure on the load cell to ensure the scale is received in operational condition. Unlock before use and lock when moving to different work locations. A superior mechanical overload protection system enables the scale to safely bear loads up to four times its rated capacity. Built to withstand serious loads but light enough to carry. Constructed from a high-strength 304-type stainless steel pan and an impact-resistant ABS plastic housing, Navigator stands up to years of use and abuse. Touchless sensors minimize the need to press the keypad with your hand, a knife or any sharp object, reducing wear and tear on the keypad, and increasing the effective life of the scale. 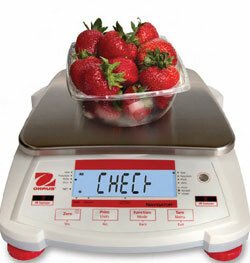 Stabilizes in less than one second to provide fast, accurate and repeatable weighing results. This helps to improve operator efficiency and to increase productivity. Includes an internal rechargeable lead acid battery that operates up to 100 hours on a full charge. This minimizes battery replacement costs. For maximum portability, the lightweight scale can be easily transported and used in any area where power outlets aren’t readily available. A wave of the hand over the touchless sensors eliminates the extra effort or time to press the keys, which helps increase convenience and efficiency. Two touchless sensors free up your hands, allowing you to focus on handling samples and keeping the scale free of contaminants. A polished stainless steel pan, corrosion-free plastic housing and spill-resistant pan sub assembly embodies a hygienic design that is easy to clean. A full-body in-use cover is available that wraps over and around the housing and keypad to guard against spills, dust and contamination.